Clogged drains are one of the most unpleasant and messy headaches you can get in your home. Of course, you can always call a plumber and get your drain cleaned, but don’t rush to make that expensive phone call. If you drain is not completely clogged you can always take some drain cleaning steps yourself and resolve that messy problem without spending a ton of money. In some cases, you might need to spend a few dollars to purchase a drain cleaner and opener, but it will still be much cheaper than contacting professional help. So here are some suggestions on how to clear clogged drains without spending a fortune. 1. Try using a simple drain cleaner to clear clogged drain. Today there are different types and styles of cleaners available for a reasonable price. Depending on you needs and preferences you can go with the chemical drain cleaner, handheld auger (such as plumber’s snake) or air burst opener. 2. If your drain is not completely clogged, you can try using hot water to clear your drain. Just pure a few cups of hot, but NOT boiling water down the drain. Let it sit for a few minutes and use the plunger to finish the job. The reason we recommend using hot, but not boiling water is because it might damage the pipe sealants. Also, it goes without saying that you should be careful with handling hot water. 3. In many cases using a simple plunger will be also enough to clean slow moving drains. Fill your tub or sing with enough water to cover the drain and pull the plunger several times until the clog is cleared. Make sure you pick up and dispose of any debris or hair that comes out of your drain. 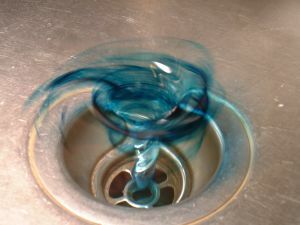 Yes, it is not exactly a pleasant task, but if you let it go back down the drain the stuff may clog it again. 4. Get a plumbers snake to clear the debris from your drain. It is a spring steel wire that is used by most professional plumbers. It goes deep into the pipes and collects the debris letting the water flow freely once again. You can pick up the plumber snake at your local hardware store or online. In most cases, using one or a few methods above should solve the problem and clear clogged drain. However, if your drain is totally blocked and none of the home techniques give you good results, you may have to seek professional help and contact a plumber.